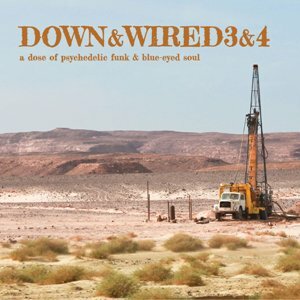 Get ready for two brand-spanking new chapters in Perfect Toy's high octane, Down & Wired series of garage-mod-soul nuggets because the label has once again persuaded the man responsible for Volumes 1 and 2 - crate digger par excellence 'Chan The Man' - to unearth even more gems from his record collection! The goodness kicks off withThe Revival's virtually unknown, but irresistible, blues-funk head nodder I Chose To Sing The Blues followed by Take 5+2'sstank slice of fuzz-heavy rnb, Motherless Child, originally (not to mention bizarrely) released on an EP handed out as a election promo giveaway for a man who later became mayor of Bonn - Hans Daniels of Germany's Conservative party, the CDU.Elsewhere,Heather Black delivers a blisteringly fast version of Third Avenue Blues Band's Come And Get It while The Turks provide an equally scorching take on Hendrix's Fire. The covers (and the treats) continue with teenage band The Aftermath'sheavy take on Junior Wells' Messing With The Kid and Hunger's Brian Auger-ish Mind Machine. Babe Wallace mixes up English and Yiddish lyrics on big band rhythm & blues monster Dizengoff and there's yet another cover (easily the best one you've never heard) of Allen Toussaint's New Orleans funk classic Get Out Of My Life Woman by the Fabulous Impacts. There's also room for The Inn Crowd's super-rareharmonica-drenched groover Run Clarence Run and Friends' My Land which sandwiches two minutes of organ-led craziness between its deceptively mellow intro and outro. Towards the end of this epic double set comes yet another Hendrix cover - 49th Blue Streak's funked-up, fuzzed-up Foxy Lady and there's an appropriate closer in the form of George Brigman's hypnotic Drifting. This is a super-hot collection of vintage rarities (accompanied by detailed liner notes and never-before-seen photos of the artists!) imbued with all the glorious imperfections of the golden age of the analogue era that artists now often strive so hard to recreate. Little surprise then that these cuts should sound so fresh today.